The Xerox DocuMate 3125 color desktop scanner quickly converts your documents; plastic cards and forms into digital files; then securely saves them on your computer or in the cloud ready to be accessed another day when needed. 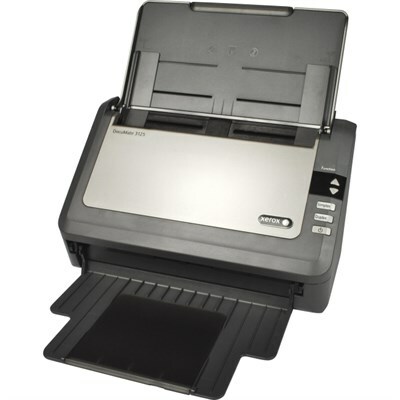 It can scan up to 46 images per minute (ipm) in duplex at 300 dpi and includes a 50-page Automatic Document Feeder (ADF) that handles everything from business cards to A4/Letter size documents. The Xerox DocuMate 3125 has an exceptionally small footprint and will fit comfortably on any desk (especially when folded closed). It is the perfect solution for organizations that need to quickly convert paper documents into searchable PDF files to be shared; organized and protected. Advanced certified TWAIN and ISIS drivers allow you to communicate with hundreds of Enterprise Content Management (ECM) and Document Image Management (DIM) software solutions making the Xerox DocuMate 3125 perfect for any office environment. The Xerox DocuMate 3125 scanner allows users to scan to the "destination" of their choice by pressing a single button; eliminating the multiple steps usually required to save scanned documents in popular file formats. Simply select one of 9 preset (yet completely user configurable) destinations; and your documents will be scanned with the correct settings for resolution; color; cropping; and file format. Final images are delivered to virtually any application; folder or device - all at the touch of a button. Take a random stack of documents from your desk. Unless they came directly from a laser printer; they probably have a few marks on them; highlighted notes; stamps; wrinkles or smudges. The DocuMate 3125 includes software that enables your scanner to instantly improve the visual clarity of every document that you scan. It intelligently adjusts every page after being scanned to a crisp and clean image. And it not only improves image quality for the human eye; but the computer's eye as well. Since OCR results are directly related to the clarity of scanned text; OCR accuracy is dramatically increased when you improve image quality. For Mac users; the Xerox DocuMate 3125 includes a fully featured TWAIN driver; ICA support; and a simple yet powerful Scan Utility; allowing you to get started right out the box.